This surname is a patronymic form of the ancient English surname and original baptismal, "Reynold." This name was first introduced into England by the Norse-Vikings, who themselves had "borrowed" it from the Germans. However the main thrust came after the 1066 Norman Invasion when it was again introduced but this time in the spellings of Reinald and Reynand. All these variant forms had a significant effect on the later 12th century surname(s), to the point where the number of different spellings is quite extraordinary. In its early form "Reynold" consisted of the elements "ragin" meaning counsel, and "wald" - to rule, and was a typical, if rather less blood thirsty form, than usual. What is certain is that in one spelling form or another, there are no less than forty five entries in the National Biography and twenty eight British and Irish Coats of Arms. 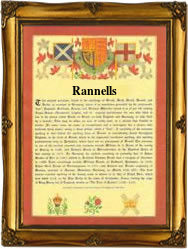 In the case of Rannells, we believe that the development was from Reynals in the early 17th century when Richard Rennalls was recorded at the famous church of St Martins in the Field, Westminster, on December 12th, 1642, and thence to Rannells, when Thomas Rannells was christened at All Hallows The Great, London, on October 23rd 1691, in the reign of 1691. On July 14th 1706 at the same church, Martha Rannells is recorded both in that spelling and as Ranells, and this is presumably the "birth" of the further spelling form. The first recorded spelling of the family name is shown to be that of William Reynand, which was dated 1272, in the Calendar of Documents of Hornchurch Priory, Essex, during the reign of King Edward 1, known as "The hammer of the Scots" 1272 - 1307. Surnames became necessary when governments introduced personal taxation. In England this was known as Poll Tax. Throughout the centuries, surnames in every country have continued to "develop" often leading to astonishing variants of the original spelling.